Collaring is the term commonly used by those in the D/s community to describe the commencement of a relationship between a Dominant and a submissive. It carries the same type of weight that a marriage ring does in its final stage and denotes the same depth of commitment. In recent times (since the advent of the Internet) we have seen a bastardizing of this ritual into something casual and transient. This attack on long-standing traditions should be actively fought by educating those entering the lifestyle. First I want to state clearly that in my opinion collaring is done only in real life, between live people, ceremonially, joyously and celebrated. One does not get married online or on the phone and one does not collar online or on the phone. The first collar offered is called the ‘Collar of Consideration’. This identification comes from the Old Guard Leather community, the same source of the Safe, Sane and Consensual code. This Collar is traditionally given at the very beginning of a potential relationship. There are many variations on how a collar may be represented in actuality. It can be by a bracelet, waist chain, anklet or another choice. This decision is sometimes determined by the situation of the submissive such as job requirements etc. Sometimes it is dictated by the Dominant’s taste. 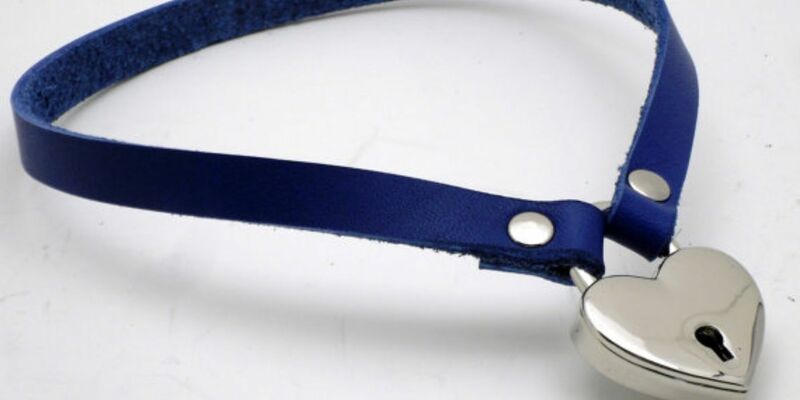 The traditional or customary representation of the ‘Collar of Consideration’ is a leather collar in some shade of blue. The actual shade of color is not as important as the color itself. The Dominant by offering this collar to the submissive is expressing an interest in pursuing a potential furthering of a relationship with that submissive beyond the range of a casual acquaintance or even the relationship between a Top and bottom. This collar is offered seriously and with intent. The submissive in accepting this collar from the Dominant is equally serious in their understanding that their relationship has moved into a different stage. The existence of the Collar of Consideration indicates to other Dominant’s and submissives that the Dominant and submissive are forming a potentially serious relationship. It’s existence acts to openly present to other Dominant’s that this submissive is ‘off-limits’ for the duration of the ‘consideration’ period and that honorable Dominant’s should not pursue this submissive in any manner. It is understood that new relationships are fragile and vulnerable to both parties involved. Respect for new relationships is shown by adhering to the presence of collars and their underlying meanings. The ‘Collar of Consideration’ does not indicate a lifelong commitment between the Dominant and submissive but might be better considered to be similar to a pre-engagement ring. Should either Dominant or submissive decide after a period that the relationship or connection is not to their desire then either may politely withdraw from the offer or the acceptance with “no-fault” to either side. If a submissive is uncollared, then it is considered important for that submissive to physically remove the collar and place it in the hands of the Dominant personally. If extensive attempts have been made to do so unsuccessfully then and only then should the submissive retain the collar. In other words, the collar is the property of the Dominant. It should be purchased, acquired or made by the Dominant, for the Dominant. Upon the severance of the relationship, it should be rightfully returned to its owner. Objects given as gifts to the submissive should be defined as becoming the submissives property and not expected to be returned should the relationship end. To keep the collar is considered to be extremely disrespectful. For any Dominant to ‘actively’ approach a collared submissive is considered an extreme breach of protocol and it should be noted that such action can have a serious negative impact on that Dominant’s real-life reputation. The traditions of our community should be given the same honor, dignity, and respect of any other. Those that actively diminish or devalue what is precious to us should be aware that such diminishment identifies you as being external to our community or a parasite upon it. If you are one of those then perhaps you should return to your sorry world where honor is nonexistent, honesty impossible to find and trust is just a word in the dictionary.